Modern marketing has outgrown just "making something pretty" or creating "snazzy headlines". Today marketers are expected to identify target markets, understand audience needs, and craft pointed messaging. There is also never-ending pressure from the sales and leadership teams to deliver qualified, quick-close leads. It's time to prove your marketing brilliance. Learn how our agency uses lead tracking to identify the most successful marketing outlets and creative pieces, justify the marketing plan to key stakeholders, and improve the customer journey from top of the funnel to point of sale. 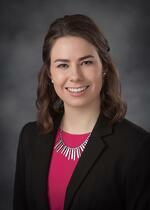 Ann O'Leary serves as an Account Executive with Kennedy Communications. Miss O'Leary graduated from Carthage College in 2014 with All-College Honors and a dual-degree in biology and neuroscience. Using her science background, Miss O'Leary dissects customer data to make strategic marketing decisions for KennedyC clients. She joined Kennedy in June 2017 after a year-long contract with the state of Wisconsin as Alice in Dairyland, Wisconsin's agricultural marketing specialist. During her year as Alice, Miss O'Leary traveled 35,000 miles across the state, marketing all aspects of agriculture via television and radio interviews, public speeches, and social media. Prior to her year of travel, Miss O'Leary worked as a corporate recruiter for Epic, a healthcare software company.